Note: This page was updated August 20, 2018. This proposal, step 1 of a two-part process, would permanently eliminate the scientific definition of "waters of the U.S." created in the 2015 Clean Water Rule and revert to an old, unclear definition. As of August 16, 2018, the Clean Water Rule's definition is in effect in 26 states, and the old definition is in effect in 24 states. This odd situation is the combined effect of a Trump Administration action delaying the Clean Water Rule's applicability, and various federal court rulings involving the rule and the delay action. Step 2: Creating a New Definition of "Waters of the U.S."
The Trump Administration has taken preliminary steps in a public process to re-define "waters of the United States" in a new way -- step 2 of the Administration's plan. The Administration has signaled its intent to propose a narrow definition that includes only navigable waters (the "Scalia" opinion), which would dramatically narrow the scope of waters protected by the Clean Water Act. https://www.epa.gov/wotus-rule/rulemaking-process. The Administration's fall 2017 regulatory agenda calls for a final rule in July 2019, but the proposal is behind schedule. For more information on action to date, see public meeting information at https://www.epa.gov/wotus-rule/outreach-meetings and the step 2 docket for pre-proposal comments at https://www.regulations.gov/docket?D=EPA-HQ-OW-2017-0480. The Clean Water Act was passed in 1972 with strong bi-partisan support. It is acknowledged to be one of our country’s most successful laws to protect human health and the environment. However, since the Clean Water Act was passed, the science of “hydrology” (the study of water) has substantially expanded our knowledge of how water moves and is affected by contaminants. The original law does not contain a clear definition of which “waters” (rivers, streams, lakes, etc.) are protected by the Clean Water Act. The U.S. Supreme Court has considered this question several times, and created confusion by providing several different interpretations of which “waters” are protected by federal law. 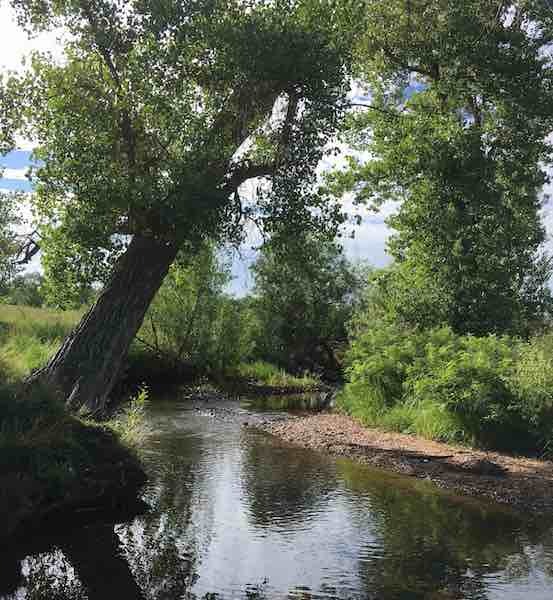 From a scientific perspective, all waters are connected – and we all live downstream. Rivers that carry large volumes of water year round are fed by thousands of smaller streams (“headwaters”) and by adjacent wetlands. Pollution discharged into smaller streams and wetlands upstream will impact larger rivers downstream. This connectivity – including pollution flowing from smaller water bodies into downstream waters – is a hydrologic reality. But regulations adopted some time ago to implement the Clean Water Act do not reflect this scientific reality. The Supreme Court decisions (containing contradictory legal tests) also don’t reflect the science. As a result, there has been considerable uncertainty for regulators and the regulated community about which waters are protected by the Clean Water Act. 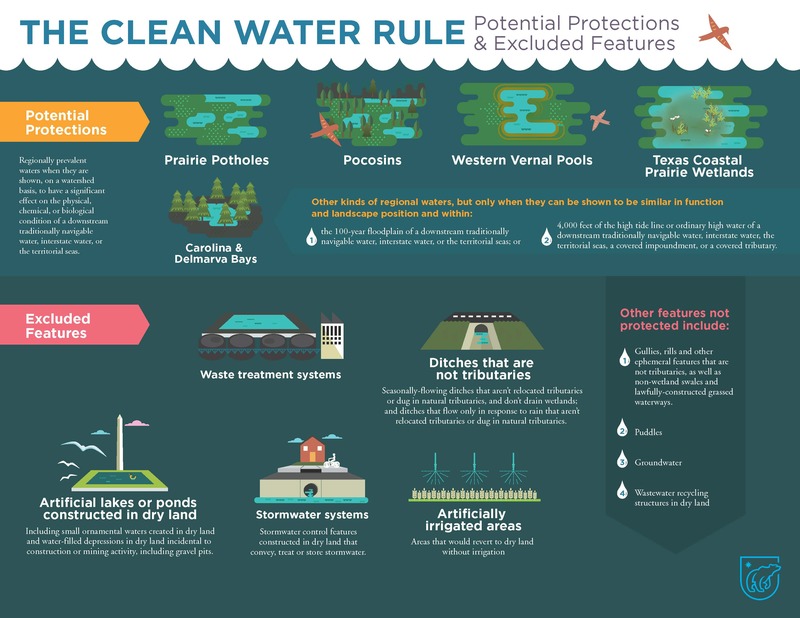 The Clean Water Rule (“Waters of the U.S.” or WOTUS rule) was issued in 2015 to more clearly define which “waters” are protected under the Clean Water Act. The Rule’s definition of protected waters is based on hydrologic science. It recognizes the real-world connectivity between large volume, “navigable” waters and smaller non-navigable streams and wetlands. The hydrologic system works a lot like our own blood system. Small blood vessels are connected to larger veins and arteries, and anything happening within those small veins can greatly impact the larger system. The Clean Water Rule protects tributary streams and wetlands that have impacts on downstream water. The Trump Administration has a two-step plan to narrow the scope of Clean Water Act protections. 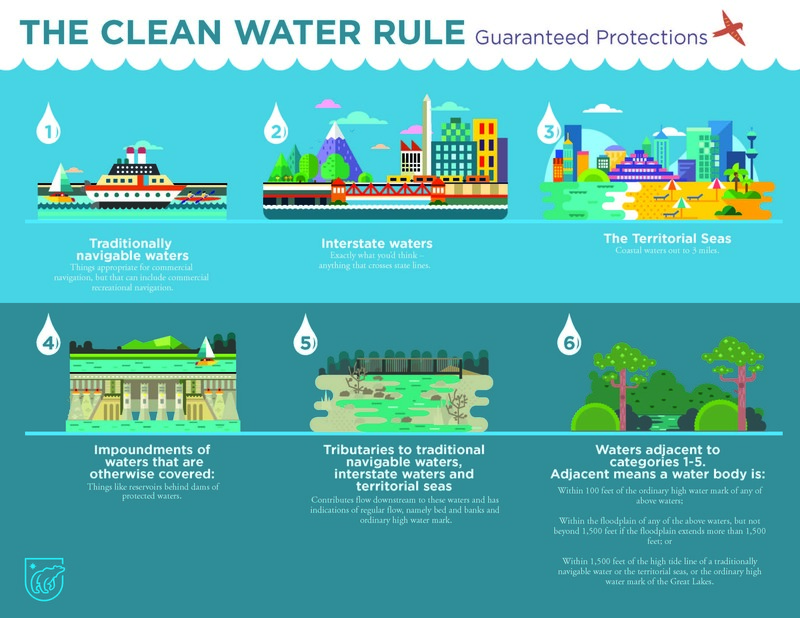 First, the Administration in July 2017 proposed to repeal the 2015 Clean Water Rule and re-codify the pre-2015 definition of "waters of the U.S." This would continue to the legal uncertainty (and case-by-case determinations) that the Clean Water Rule was designed to clear up. Although the comment period on original Clean Water Rule repeal proposal ended in September 2017, the Trump Administration on July 12, 2018, published a supplemental proposal to clarify that the proposed repeal would be permanent, and to request further public comment on the legal basis for the 2015 rule. Second, Trump Administration officials plan to issue a second rule with a different definition of which “waters” are protected by the Clean Water Act. The Administration has held teleconferences and meeting to gather input but has not yet issued a proposal for the second rule. The Trump Administration has signaled its intent to define Clean Water Act protections very narrowly, providing protections only to “navigable waters.” This definition would exclude thousands of miles of smaller streams and millions of acres of wetlands all across the U.S.. Since many of these smaller waterways are in the headwaters of larger rivers, pollution from these excluded streams would inevitably impact “navigable” waters downstream. In the meantime, there's been other related action -- the Trump Administration delayed applicability of the 2015 Clean Water Rule for two years, until February 6, 2020, and multiple district courts have considered legal challenges to the Clean Water Rule or the two-year delay. After an August 16 decision by a federal district court in South Carolina, the Clean Water Rule is now in effect in 26 states. However, the pre-2015 definition is in effect in 24 states. For more information on the litigation history, see the announcement of the court decision by Clean Water Act and the court decision itself. Typical Western stream in mid-summer. The high water mark is clearly visible. In the Western U.S., most of our rivers and streams are not “navigable” year around. Western watersheds characteristically include many miles of waterways where water may be only be present seasonally. The “navigability” test would remove Clean Water Act protections from most of our Western rivers – waterways that we depend on for drinking and irrigation, and that are critical to to the survival of fish and wildlife. The Rule does NOT change the status of waters that are part of Municipal Separate Storm Systems (MS4s). Most MS4s are currently covered by statewide General Permits (although some states use individual permits). The status of these permits is not changed by the Clean Water Rule.6 Municipal wastewater treatment systems are also excluded. Clean water is essential to our public health as well as to our economy (cite local examples, i.e. tourism, agriculture, brewing industry, etc.). Nearly 45 years after the passage of the Clean Water Act, we have made tremendous progress, but many of our rivers, lakes, and bays are still not safe for swimming or fishing. Rolling back the Clean Water Rule will set that progress back. In tandem with the administration's proposal for dramatic cuts in EPA's budget, the proposed repeal represents an assault on health and environmental protection. The proposed repeal of the 2015 Clean Water Rule would leave unclear which waters are protected under the Clean Water Act, potentially leading to less coverage and putting drinking water supplies for millions of Americans at risk. Clean water protections could be even more severely damaged if the Trump Administration were to reduce Clean Water Act coverage from the scope of coverage that existed prior to the Clean Water Rule. Repealing the rule will leave unaddressed regulatory confusion and uncertainty for the regulated community that, under the pre-2015 definition, resulted in broad-based calls for clarity about which waters the Clean Water Act protects. EPA noted in issuing the rule that protection for about 60 percent of the nation’s streams and millions of acres of wetlands has been confusing and complex as the result of Supreme Court decisions in 2001 and 2006.8 Rolling back the rule is bad governance, bad for businesses who rely on regulatory certainty, and bad for our communities that deserve clean water. The “repeal and replace” process for the Clean Water Rule is similar to the ongoing process for health care and will result in similar confusion. Low-income communities and communities of color are already disproportionately impacted by contaminated water. Contaminated water can cause a variety of health problems, especially for children. Repealing the Clean Water Rule could put many of these communities at further risk. Small and rural communities, who rely on private wells or whose water systems lack the resources to deal with polluted sources, may be hit the hardest by the roll back. In the semi-arid West, most of our waterways do not run year around but rather flow seasonally or intermittently, and pollution from these waterways will ultimately flow downhill into permanent rivers and lakes, and the sea. Sportsmen, conservationists, and recreationists know the critical importance of clean water and its essential role in maintaining fish and wildlife populations. Rescinding the 2015 Clean Water Rule will also place additional burdens on EPA and the Army Corps of Engineers at a time when these agencies are already under difficult staffing and budgetary constraints. Any revision of the 2015 Clean Water Rule should be based on sound science and public input. with this act in place. Thank you. I urge the EPA to preserve all protections for our lakes and streams. Clean water protects people and wildlife and contributes to the economy through jobs and recreation activities.